Russia and other countries in Central and Eastern Europe have experienced a resurgence of Orthodox Christian identity since the fall of the Soviet Union, according to a new Pew Research Center survey of 18 countries in the region. This increase in religious identity is accompanied in large part by high levels of religious belief, such as belief in God. 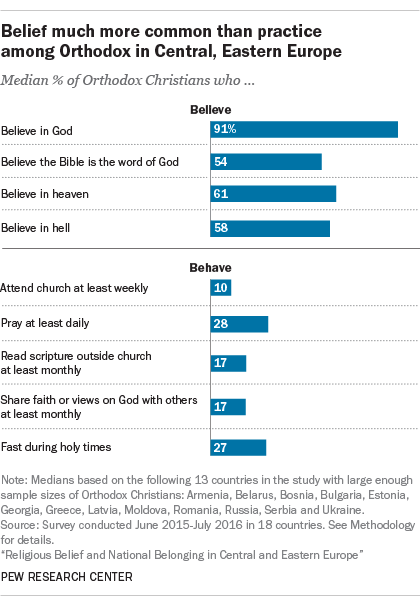 For example, the vast majority of Orthodox Christians in the region – a median of 91% – say they believe in God. (The median is based on the 13 countries surveyed with a large enough Orthodox population to sample.) Large shares also say they believe in heaven and hell and that the Bible is the word of God. But their orthodoxy does not necessarily translate into high levels of practice, or “orthopraxy” (derived from the Greek for “action”). For instance, a median of fewer than one-third of Orthodox Christians in the region report praying daily and fasting during holy times such as Lent. And even smaller shares say they attend church at least weekly (median of 10%), read or listen to scripture outside of church at least monthly (17%) and share their faith at least monthly (17%). By comparison, Catholics in the region, while just as likely to report certain religious beliefs, such as belief in God, are more likely than the Orthodox to engage in religious practices such as attending church weekly, fasting, taking Communion and sharing their faith. Indeed, a median of one-in-four Catholics attend church weekly, compared with only one-in-ten Orthodox Christians. In addition, 28% of Catholics report sharing their faith monthly, compared with a median of 17% of Orthodox Christians. And Catholics are twice as likely as Orthodox Christians (54% to 27%) to fast during holy times. Some of these differences are even larger in countries with substantial shares of both Orthodox Christians and Catholics. For example, while Catholics throughout the region are only slightly more likely than Orthodox Christians to pray daily and read scripture monthly, in Bosnia, 58% of Catholics pray daily, compared with 28% of Orthodox Christians. And in Ukraine, 40% of Catholics read or listen to scripture monthly, compared with just 23% of the country’s Orthodox Christians.